So this got me interested and I decided to look into Maze. 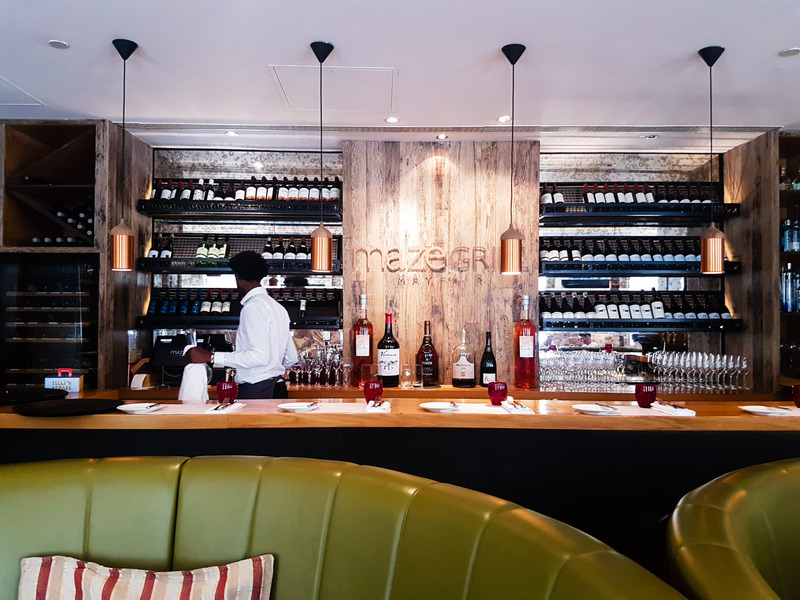 Now, the Maze Grill Mayfair is a hotel restaurant that is part of the Gordon Ramsey empire which offers up food like steaks, sushi and modern grill fare with Asian influences. 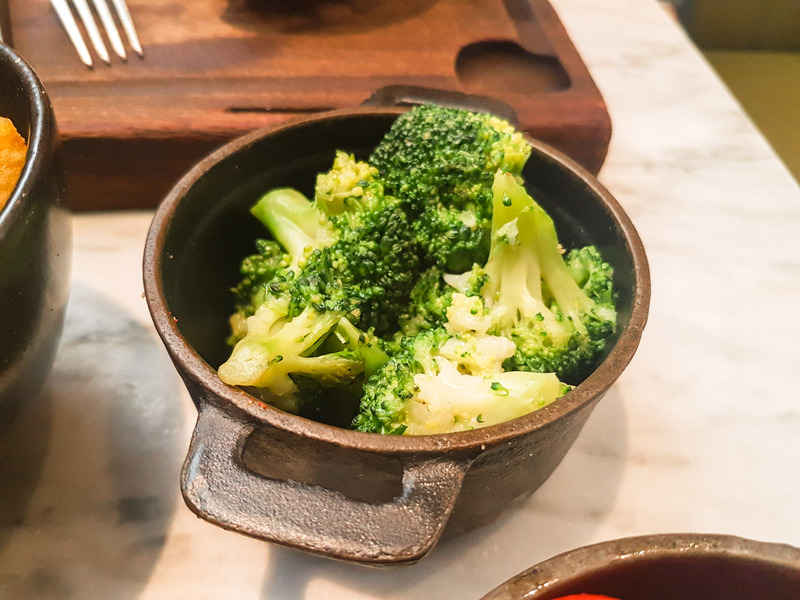 It also turns out that they do a Sunday lunch, with unlimited sides for only £27. 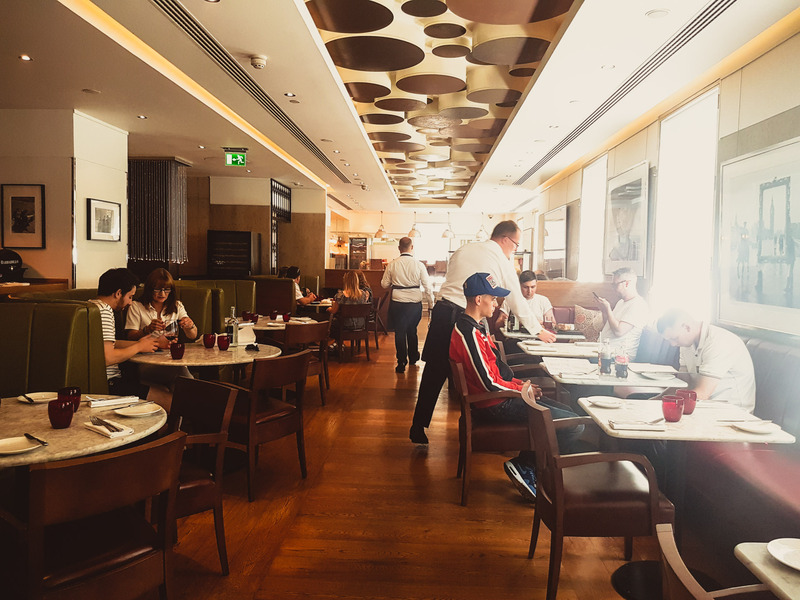 It’s located in Grosvenor Square, a few minutes walk from Bond Street Station, and as it’s a hotel restaurant you can enter via the hotel or main entrance., Once you enter the venue you feel the relaxed and chilled atmosphere for a Sunday in a modern clean design. We were welcomed by the maître d or manager (I think) and shown to a table. Just a note on this chap, very welcoming and he knew about my pre-order of halal for the Sunday roast. Now on the menu, it says Roast beef, however, once we sat down we were told that we have been pre-ordered with a steak cut of rib eye. The reason behind this is that you need at least 4 people for the roast beef joint, due to what I believe is portion size and costs. Fair enough. I was really expecting and looking forward to a roast beef lunch, but at least I was getting some type of red meat! Sadly, the halal Sunday lunch does not come with the bone marrow and gravy as stated on the menu as they not halal. Also on the menu are potatoes which are made with the natural fat from wagyu, the wagyu is not halal either. 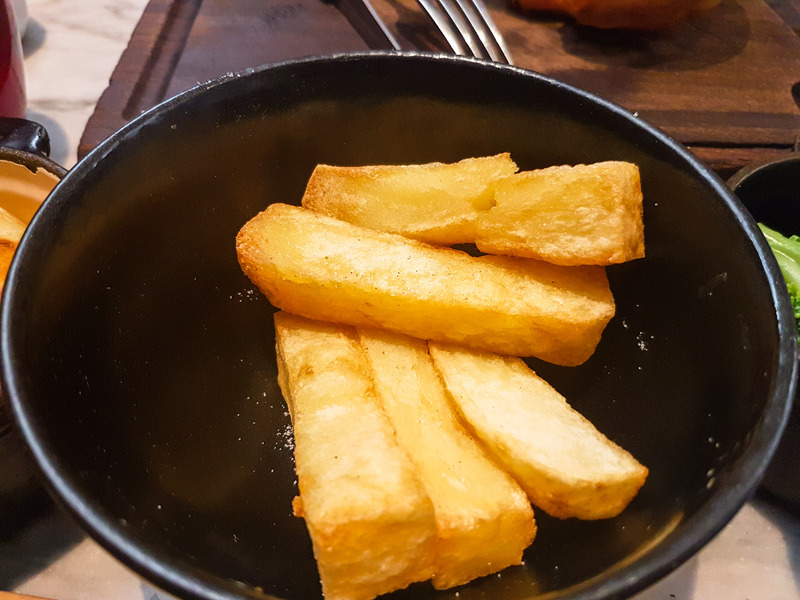 However, they replaced these for some thick, soft fluffy chips. 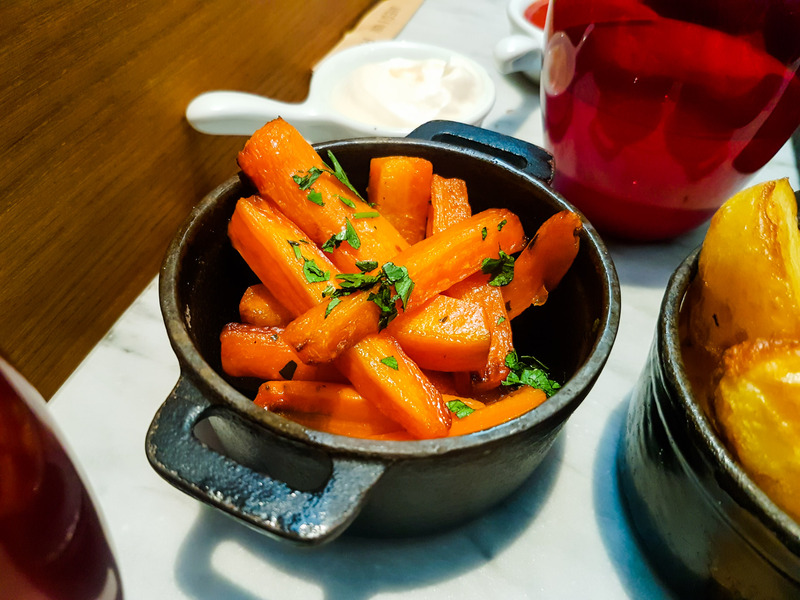 On the day we also got some honey glazed baby carrots, tender stem Broccoli and a simple but really nice tomato, onion and red radish salad. We also got a giant Yorkshire pudding as well. Oh, the sides are also UNLIMITED!!! More chips, please! 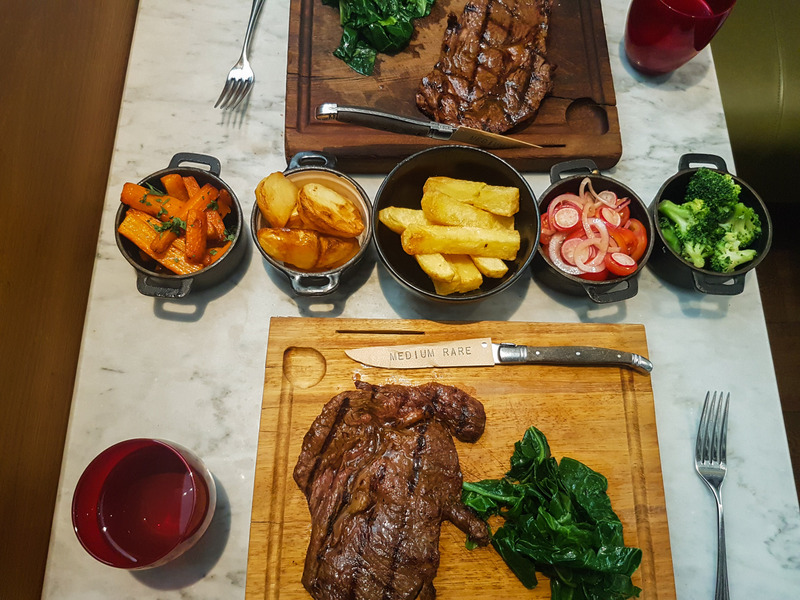 We got 2 steaks medium rare and both arrived on a wooden board with some greens. 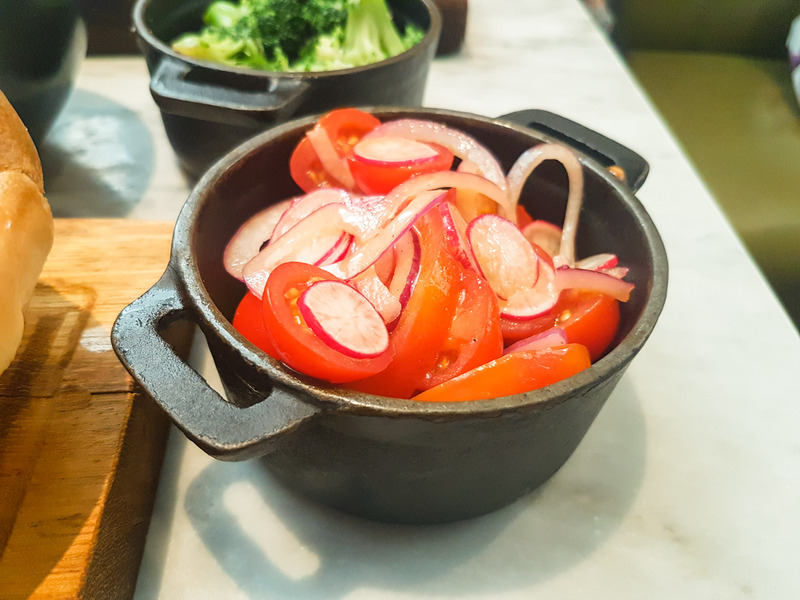 The steaks were a proper medium rare, loads of pink in the middle, a bit too much pink in the middle for my dining companion so we had to send that back to get it done a bit more – it came back medium. For me, it tasted better medium than my medium rare. The size of the steak was a little thin but the amount was just right, It was also heavily seasoned with a little too much salt for my liking. 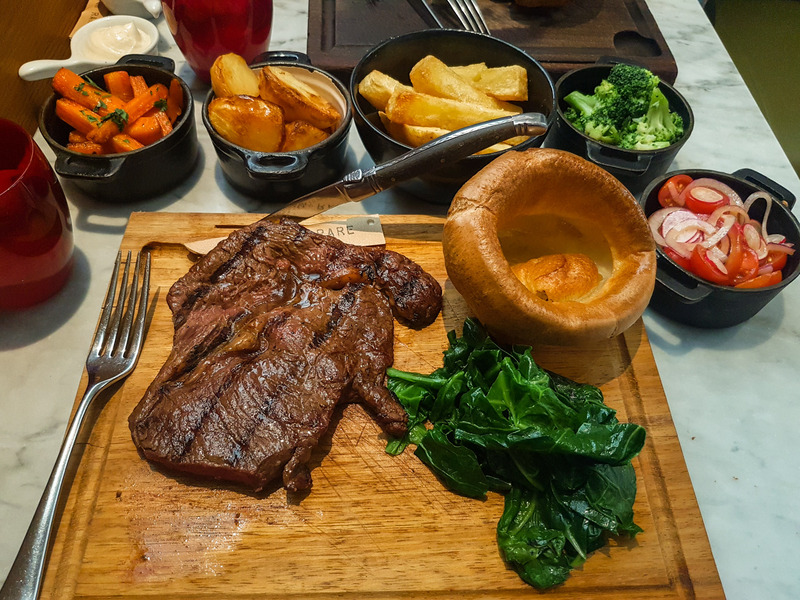 It didn’t feel like a “Sunday Roast”, but for £27 for halal steak in central London with loads of sides, I think it’s a winner. Just remember to call ahead and book halal in advance. 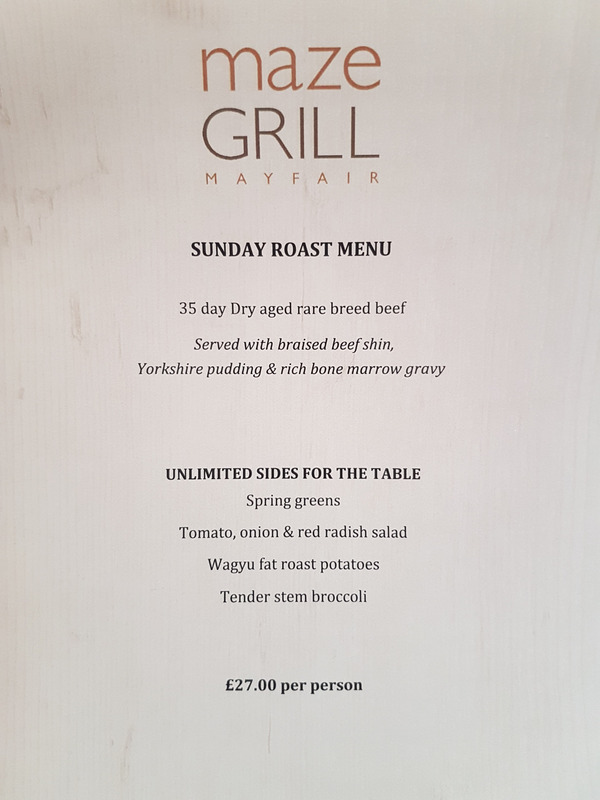 If you want a roast, make sure you book for at least 4 and confirm that you will get a roast and not a steak. 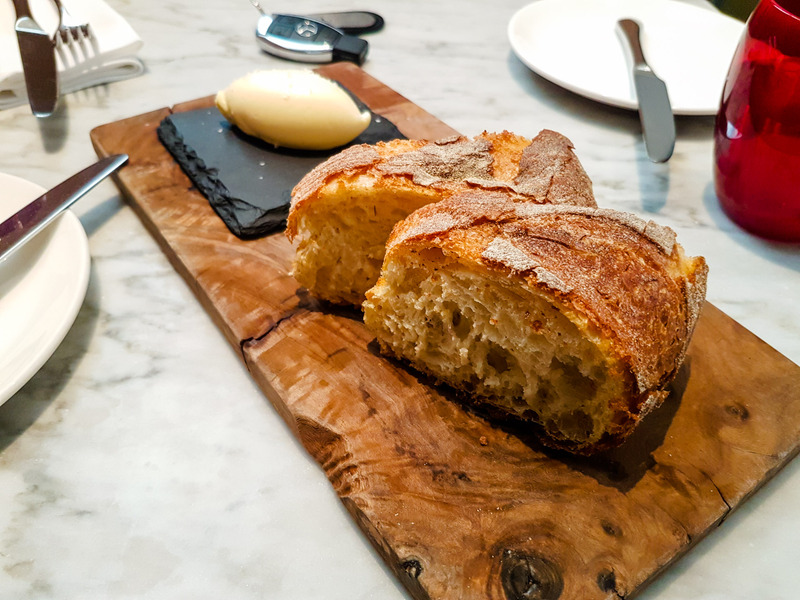 They also charged an unexpected cover charge of £2 per person, which I asked to be removed, I’ve found a few places doing this now, charging for bread. Quick secret tip! Ask about a keyring, it gives you 50% on Mondays! I had a nice time here, service, decor, atmosphere and of course food were all nice. 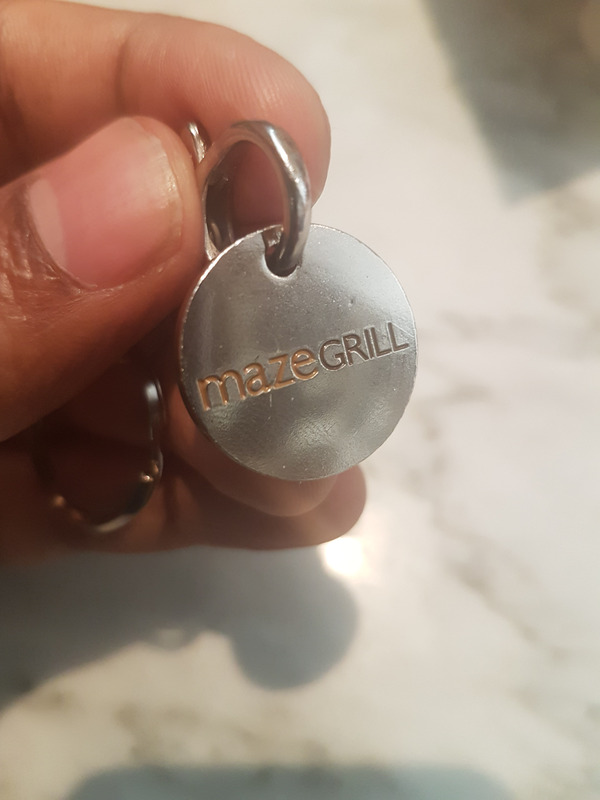 Hey Buddy!, I found this information for you: "Maze Grill". 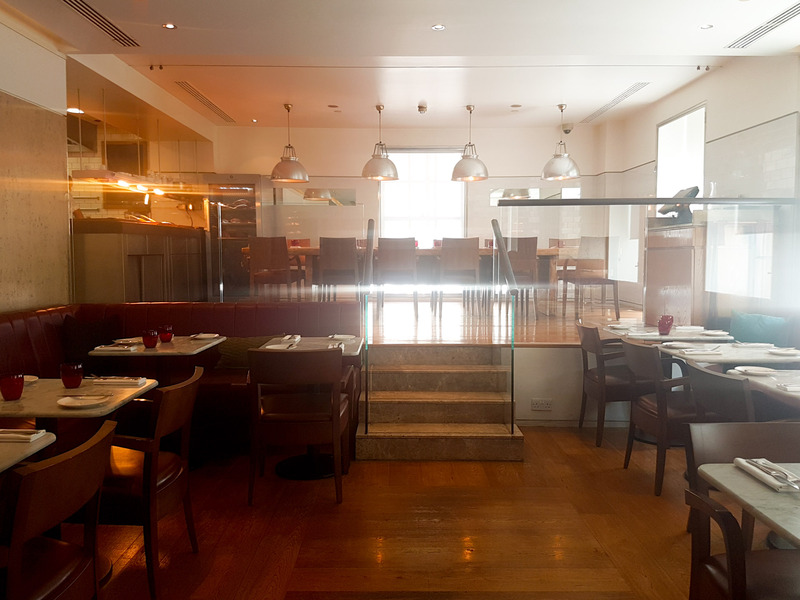 Here is the website link: http://halalfoodguy.co.uk/maze-grill/. Thank you.